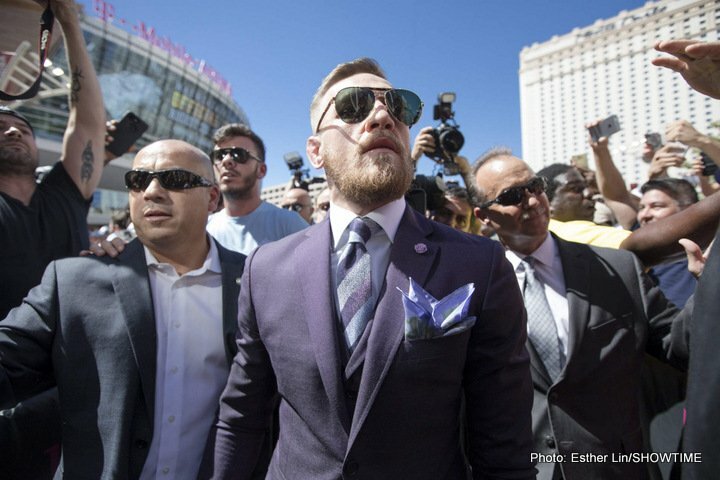 The grand arrivals took place yesterday evening in a buzzing Las Vegas, with Floyd Mayweather and Conor McGregor given the red carpet treatment. Though Saturday’s crossover fight has been, and is being, derided by many, the fans in attendance are excited about it. Down to curiosity it may be (fans are wholly unsure of what to expect when the bell rings) but millions of people are expected to tune in – one report says that as many as an incredible 1 in Six Americans could wind up watching the bout on TV. Mayweather, though, says he has doubts McGregor has trained as hard as he should have for the contest; at least Mayweather strongly suspects the MMA star is currently carrying a good deal of excess weight – perhaps as much as ten-pounds more than the 154 pound weight limit allows. Many fans are expected to attend Friday’s official weigh-in while millions will likely tune in on TV. Will McGregor struggle to make 154, or is Mayweather merely “praying” for an advantage?